On this day retreat you will experience both mindful movement and meditation interspersed with teaching and reflection. Hatha yoga is a physical form of yoga. The word ‘hatha’ is made up of two Sanskrit words; ‘ha’ which means sun and ‘tha’ which means moon. The objective therefore will be to bring balance and harmony to the body and mind. Postures will be adapted around the needs of your individual body and is suitable for people with or without prior experience. The yoga practices included in the day retreat will range from energetic standing sequences to gentle restorative postures. 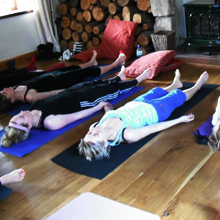 Leonie Luxon has over ten years’ experience as a yoga teacher. She holds a British Wheel of Yoga Diploma and has taught at various venues in Manchester and Sheffield from Sheffield University to Virgin Active, and recently the Department of Education. She also holds a level three Pilates qualification and her sessions bring awareness to postural alignment. Mindfulness is about bringing awareness to our present experience without judgment. It includes paying attention to our mind, emotions and body sensations with gentleness and kindness. Meditation helps to rewire our brains to be less reactive and busy. This enables us to have more choice in how we relate to life. In this day we will explore more of what mindfulness is and experience a range of practices which will leave with a deeper understanding of ourselves. Jane is an accredited Mindfulness teacher with Breathworks and is listed on the UK Network of Mindfulness teachers. She also has many years of experience as a nurse working in both London and Sheffield. Jane currently delivers a number of eight-week Mindfulness programmes for stress, health and parenting. In addition, she has facilitated workshops and workplace sessions for organisations such as John Lewis and Hallam University. During this workshop there will plenty of opportunity for connection, chat and tea drinking – plus the opportunity to ask questions in a safe nurturing space. The workshop will start at 10am with tea, coffee and pastries with practices starting at 10:30am. Please bring a packed lunch with you, a yoga mat, a blanket and optionally a yoga block or cushion. Sharrow Performing Arts Space is a warm, inviting venue which is ideal for yoga and mindfulness. It light and airy, featuring a heated floor and separate changing rooms for your convenience. There is a large free car park you can use too.